There's a new sewer (sewist, seamster....aghhh I give up!) in the sewing blogosphere and it's a man. Yey! 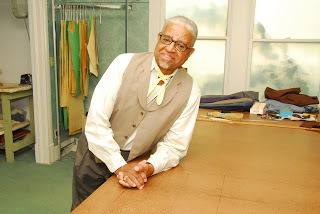 Gentleman Jim, a master tailor, pattern maker, designer, sewing instructor and clothing manufacturer, has been active in the garment industry since 1961. He began working in the garment industry in 1961 at all the finer men’s stores. Weber and Heilbrunery, John Davidson, Barney’s Men’s Store and The Macy. At age 20, Gentleman Jim began under the mentorship of Orie Wells of Orie’s Custom Tailoring, an exclusive tailoring store. Orie’s was located on 125th Street in New York City next to The Apollo Theatre. In the 60’s, Orie’s made custom clothes for all the great stars: James Brown, The Isley Brothers, B. B. King, Duke Ellington, Billy Strayhorn, James Cleveland and many more. He now has created a super cool blog, The Lost Art of Fine Tailoring, which you can find here. To celebrate joining the blogging community he's giving away a fantastic set of his Alteration DVD. This DVD looks amazing and I am definitely keeping my fingers crossed for a win. You too can enter here! All you have to do is leave a comment on his blog and also post something on yours. Simple! So lots of love and luck to Gentleman Jim in having a successful blog, and lots of luck to you in entering his awesome give-away!